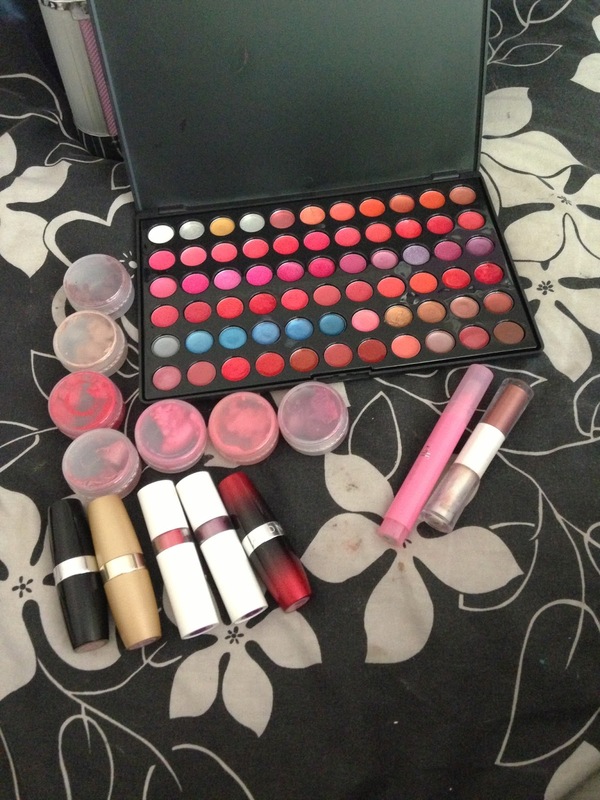 Kiss & Makeup : Whats in my kit? Hey everyone! I hope your all enjoying the sun! I know i am! 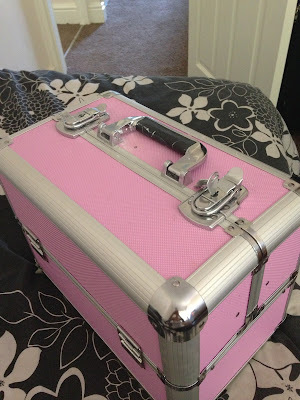 I thought id do a post on whats in my makeup kit as im building my kit up at the min and starting out as a makeup artist so i thought id share with you all what sort of products i keep and what i use. Ive always been interested in fashion and beauty, but makeup has always just been in the background. Ive been wearing makeup since i was about 14/15 but didnt really think about the different products that are out there and the many things that are available! Since i finished my fashion course last may, i had a lot of free time and just started playing around with the little makeup i actually had, then i thought id watch a few youtub videos to see if i can get anything out of it, and if any of you have watched any makeup tutorials you'll know that they are super addictive! After spending the whole day watching makeup tutorials it sort of snowballed and found myself buying everythign and anything just so i can play around and experiment with it all! 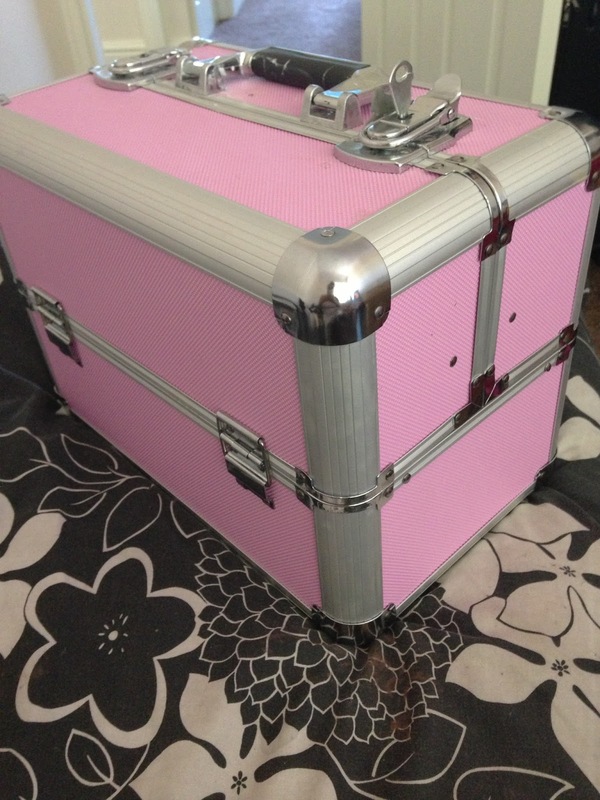 So to start off with, i brought my makeup case from ebay for about 20 and it was well worth it! It got delivered within about 2 weeks. I was so excited when it came throught the post and couldnt wait to open it! It has a large compartment for the main body and then 2 sets of side draws with slots to make the compartments for the draws as big as you want, i suits me perfectly because as i buy products, i can rearrange them to suit me! 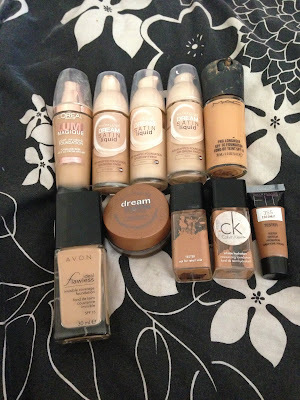 For me, foundation is the one product that i can spend a lot more money on than other products becuause i think a good foundation is the one thing that can pull together a look. When i first started building my kit i knew i needed a rage of foundations, so i brought the lighest shade, the medium shade and the darker shade of the collection. I knew if i had the 3 basic shades i can mix the foundations together to create the perfect shade for the client. I love buying concealers, i think theyre magic! I used to have quite a collection of concelears but as time goes on they either dont stand the test of time or simply get used up. 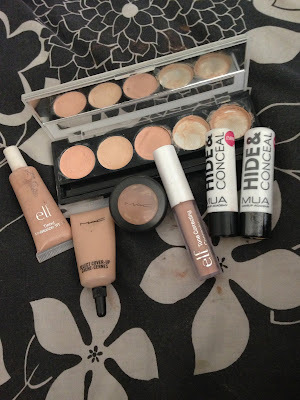 I think concealers are one of my favourite products, i use it for brightening under the eyes, concealing blemishes, primers for the eyes and even highlighting! from left to right: W7 concealer palette, elf tinted moisteriser, MAC select cover up NW 30, MAC studio finish concealer NW 30, elf tone correcting concealer, MUA hide and conceal in almond. 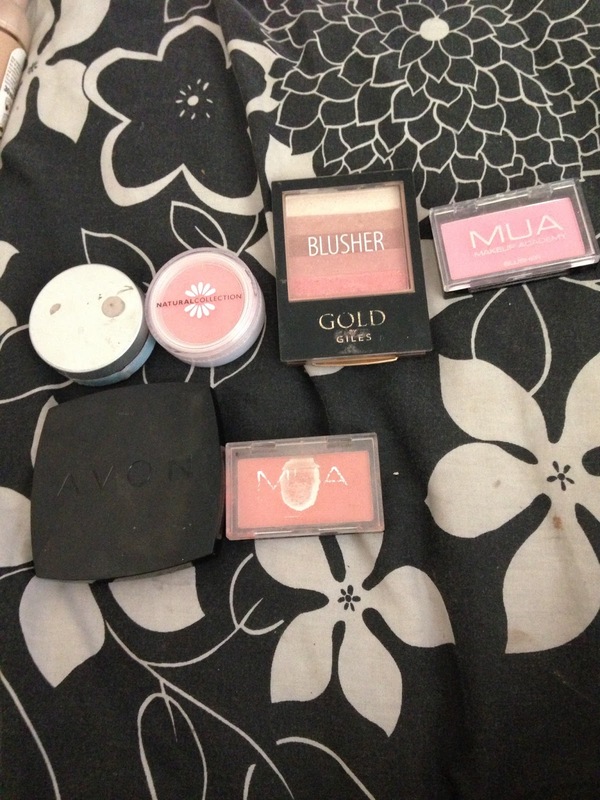 When i buy blushers i dont really care about the different shades as long as the pigments are workable. The only time i really think about the shade unless im buing for myself as i do like a specific type. 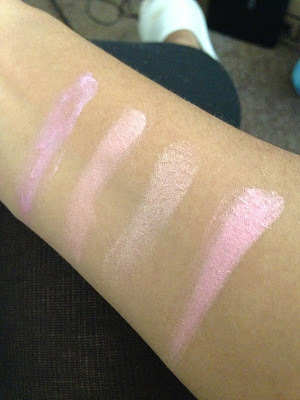 If i know that i have many different types of blushers in my kit then i know that i can cater to everyones skin type and shade! I love a bronzed look, i like the shimmer and using a bronzer to highlight and contour a face! 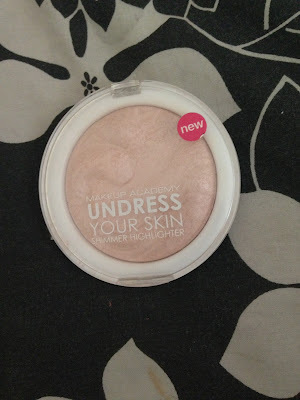 I use quite a bit of bronzer in a look and for other people because i like creating the look of a bronze glow! 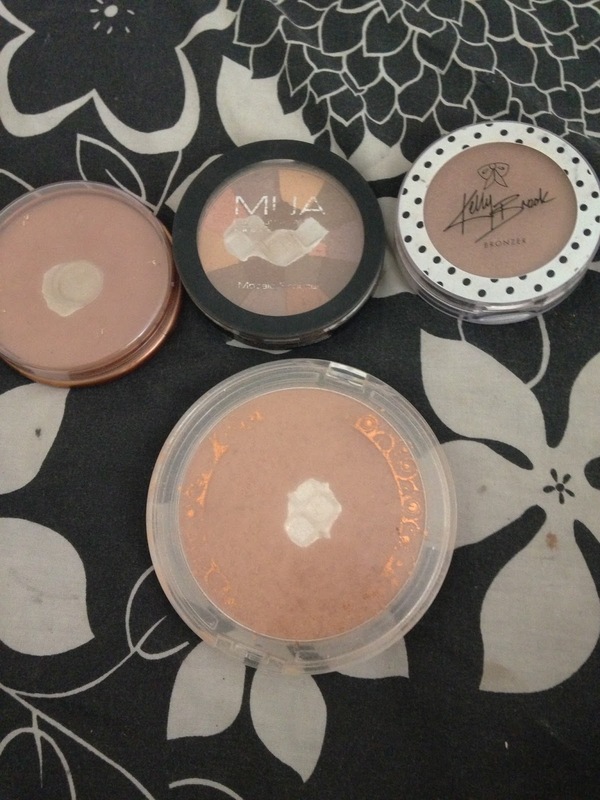 check out some of the bronzers ive got below. I dont use a lot of highligher products because i think i can use other products to highlight such as loose pigments and glitter and even eye shadow. from left to right: Rimmel lodon natural bronzer in 022, MUA academy mosazic bronzer, Kelly Brook bronzer in African queen,collection bronze glow in 01 sunkissed. 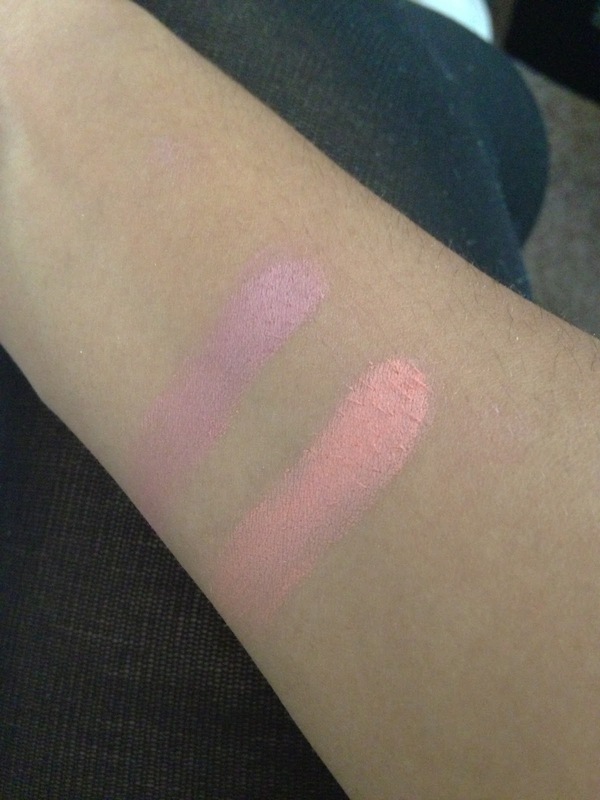 I love love love lip products! I love everything about them, the colours, the textures, the way their applied! everything! so when i do buy lip products i really like to stock up! I think if your just starting out as an artist then palettes are your best option as they have loads of colours and are so easy to store! 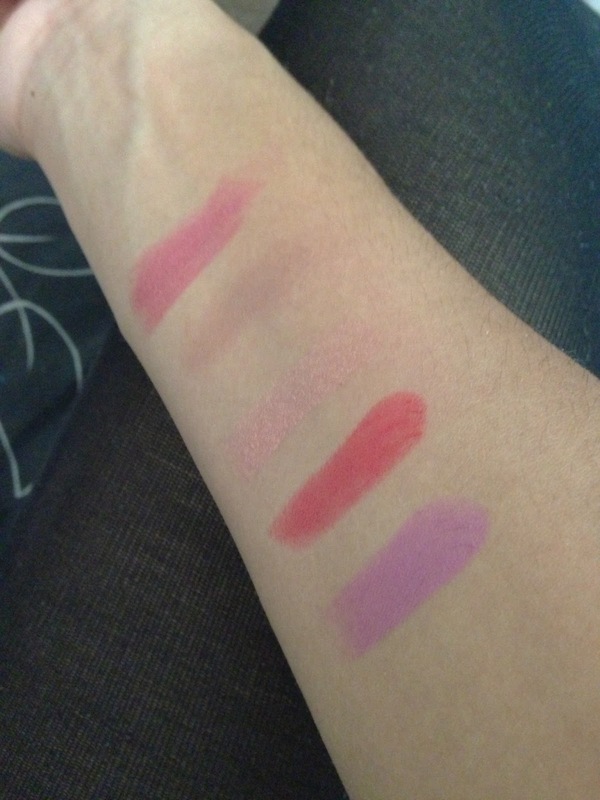 from top to bottom: avon shimmer lipstick in 'majestic mauve', avon shimmer lipstick in 'show some skin', avon 24 carat gold shimmer in pink, color trend matt lipstick in 'poppy love', colour trend matt lipstick in 'intimate'. 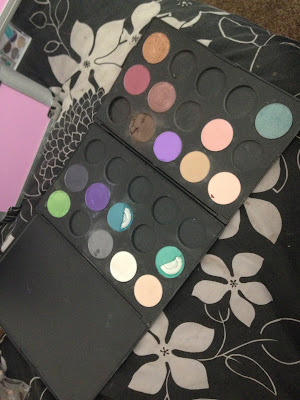 I wanted to create my own palette and decided i would do that by buying a few empty palettes online and started to fill it up with my single eye shadows from MUA academy! 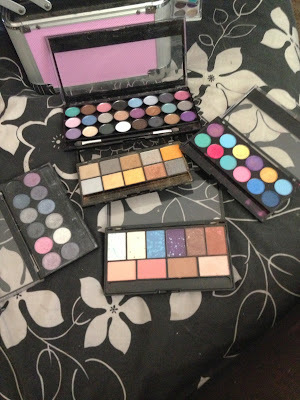 They are one of my favourite shadows, they are so pigmented and last all day! This was the first eye shadow palette i brought and i got so exciting! 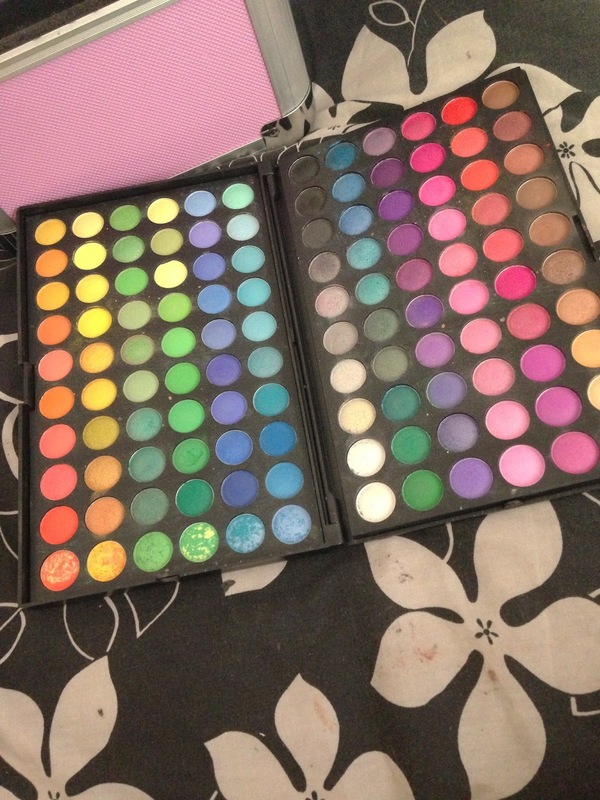 This is a 120 shadow palette from ebay and has almost every colour there is! 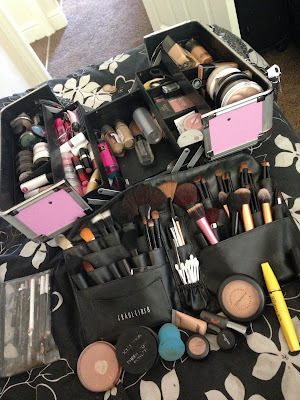 Its so useful and easy to use and fits right in the bottom of my kit! For more pigmentation I use MAC fix+ and works like a dream! I cant go into superdrug without buying one of these! They are the single eye shadow palettes that come out every so often from MUA Academy and super useful at only 4 a palette! I keep all of my pencils in a clear pencil case like eye liners, lip liners, eye liner felt tip pens, brow pencils etc. I keep them all in a clear case so i can see them all easily and quickly! I keep brands such as; MAC, MUA academy, avon, Helen E, Rimmel, colour trend. Primers: I dont really use primers but there always in my kit unless i do need them, i keep 2 eye primers and a face primer for blemishes on the face. 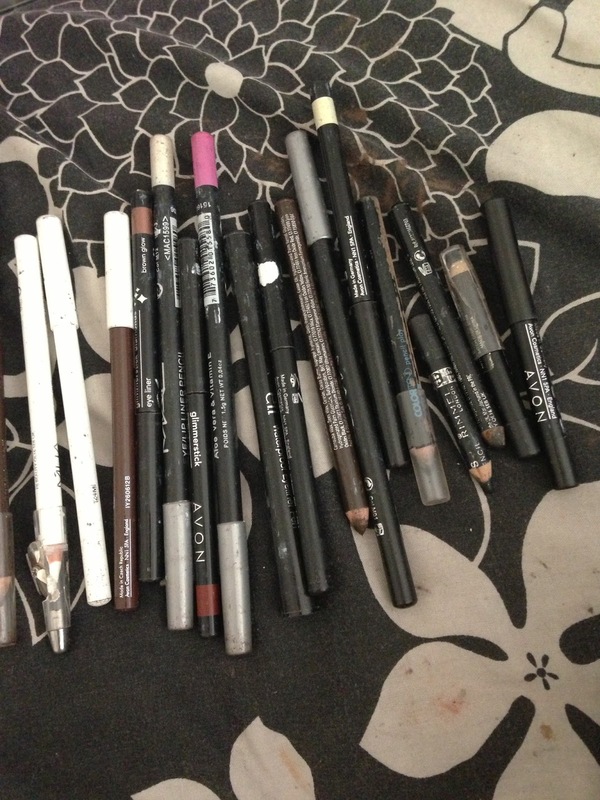 For primes i normally go to a concealer cause theyre always to hand! 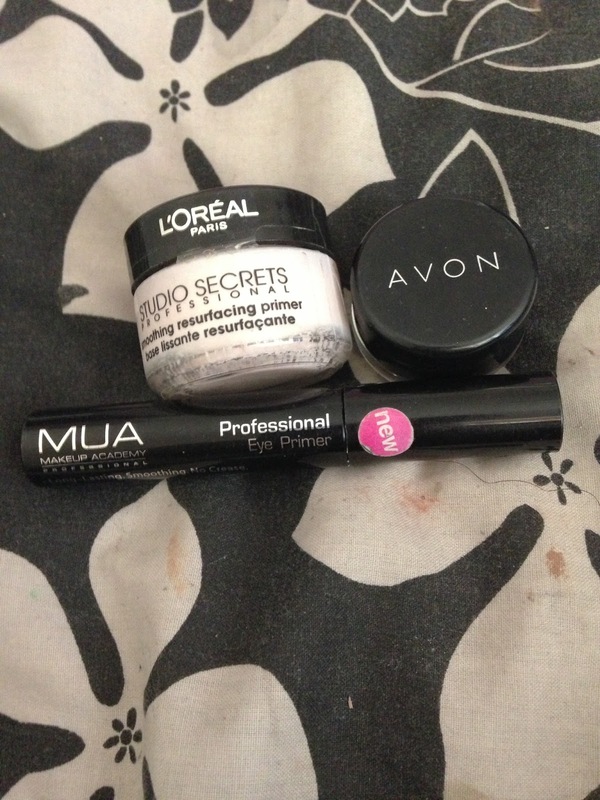 left to right: L'Oreal studio secrect face primer, avon eye shadow primer in beige, MUA professional eye primer. 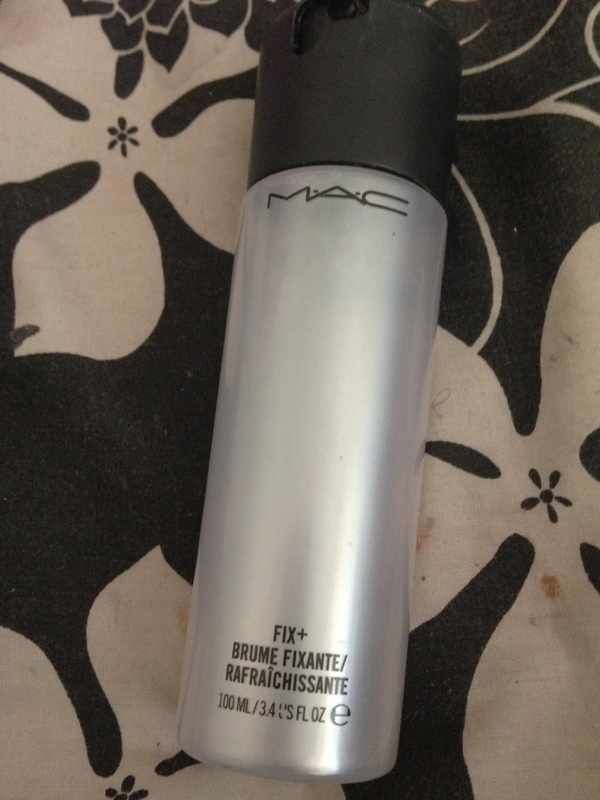 My MAC fix+ has to be one of my favourite products ever! It has so many purpose and is a god send in the summer! If you would like a swatch and review on the single palettes from MUA or my brush belt, leave a comment below and i will post one soon!